Move over shade tree. This unassuming plain-Jane four-car garage , with a side order of RV storage, just might replace you. Two double bays provide a great working and storage space for the auto enthusiast. Imagine turning a part time hobby into a genuine home business because this plan provides space for a big-boy office. Skylights provide natural light in the loft to help guide one through 1069 square feet of storage. With a full bath next to the office, there is no need to take “work” home with you, when it can be washed down the drain. Did I say “plain?” As plain as socket wrench. You wouldn’t go to the party without one. 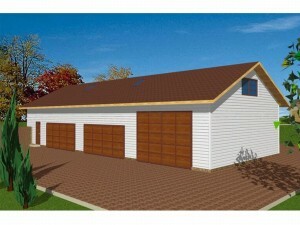 For more RV garage loft plan like this one, please browse our RV garage plan collection. If you have spent any time around older folks, you may have heard of a radio show from way back in the day called Fibber McGee and Molly. Fibber had a hall closet that he stored everything in and when the door was opened an avalanche of items fell out. Anyone who lives with a minimal amount of storage space can certainly sympathize with this situation. Just where can you go with all of your stuff? 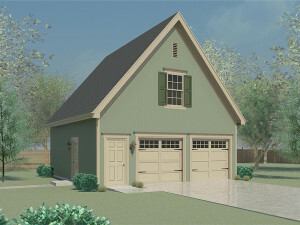 This two-car garage plan that is right up your alley or maybe just behind the house. Not only is there space to house two autos and a workbench for all those projects that you can’t do without one, there is a loft with 485 square feet of storage. Organize all of that extra clutter that has nowhere else to go. If you miss Fibber’s closet, don’t worry, there’s one included with this garage loft plan right next to the workbench. For those looking to make a getaway on weekends, holidays, or vacations this 2-car garage includes a third bay large enough to park the family RV. The 2-car garage offers a 16’ wide x 8’ tall garage door and 9’ ceiling, while the RV bay’s accommodations include a 10’ wide x 12’ tall garage door and a 13’ ceiling height. However, with these measurements not only does the RV bay allow a place to park an RV or motor home but even allows space for boat storage. Not being limited to only RV and boat owners, the spacious large bay can also be used as a gym space, providing enough room to support several pieces of workout material and equipment. Located above the 2-car garage is a loft allowing space for storage. 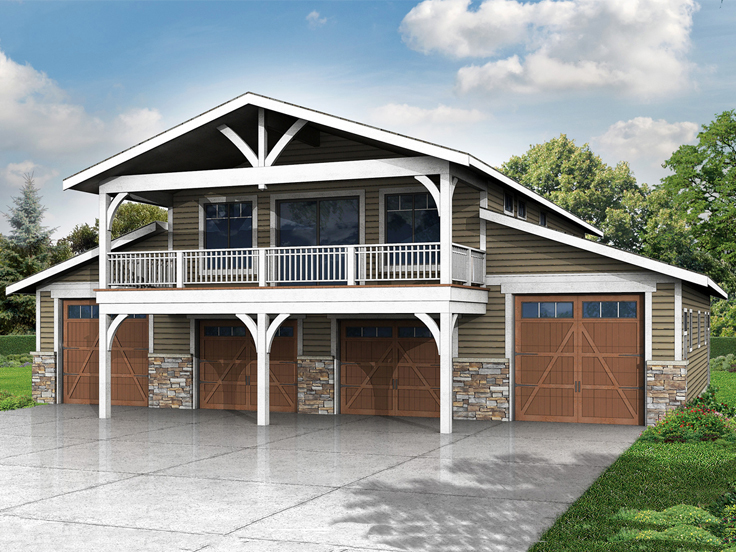 The amenities of the garage go beyond the interior, as the exterior features a Craftsman style design promising to be a perfect complement to any Craftsman style home. 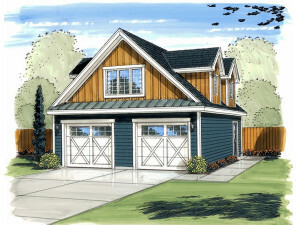 View details about this RV garage plan with loft. 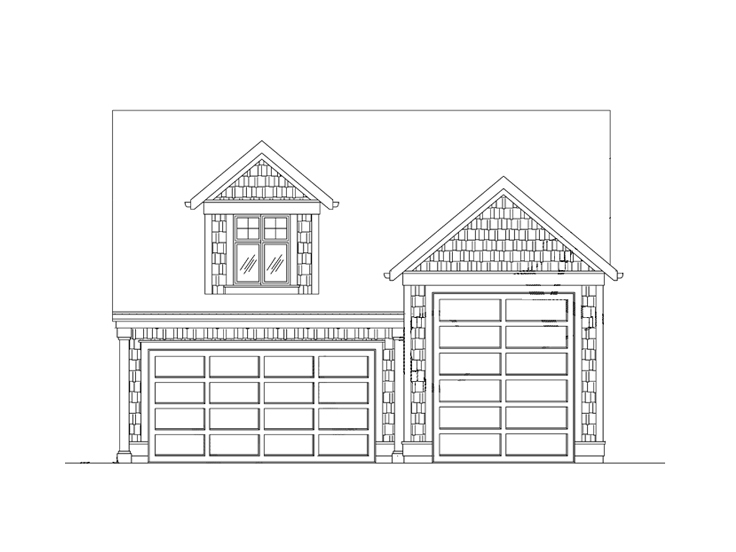 To view additional RV garage plans please visit, our RV garage plan collection.